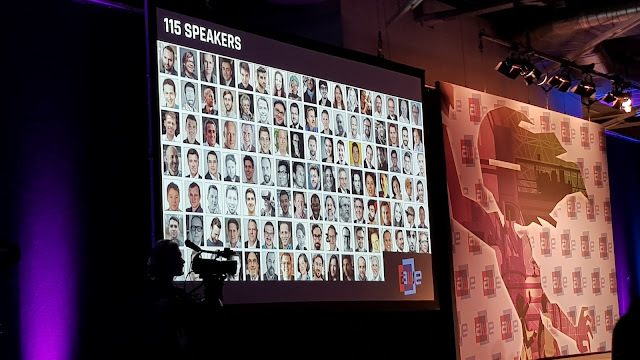 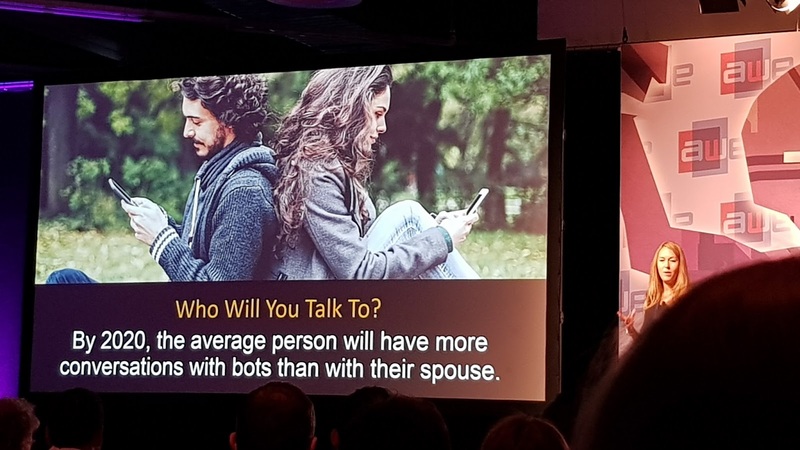 Last week I had the pleasure to give a talk at AWE Europe and was also able to attend it with nearly 1,500 other attendees, 100+ speakers and 90+ exhibitors. 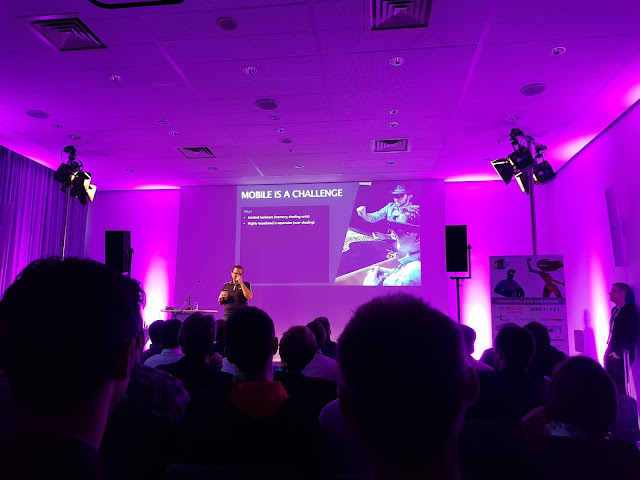 AWE was a great conference and allowed me to connect with old and new contacts but also to experience lots of new hardware, software and attend some very good sessions. This blog post gives a little recap of the event and the things I experienced using photos I've taken. It starts with the keynotes, after that it highlights a few great sessions and finally covers a collection of new devices and experiences I've seen at the expo. 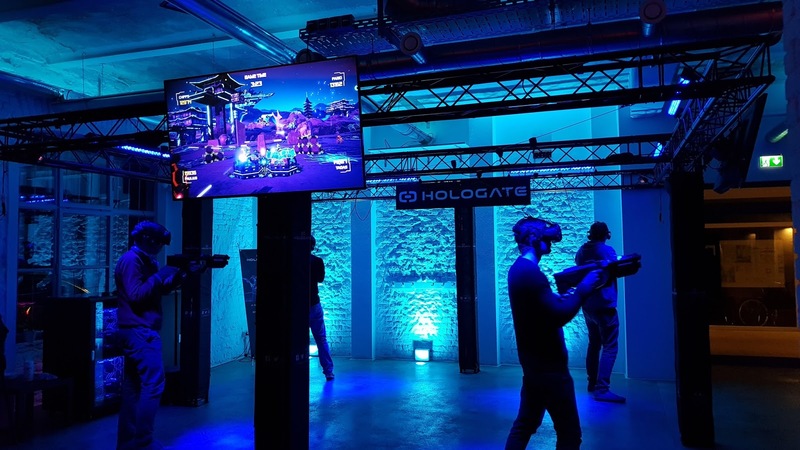 Make sure to read till the end and check out the great summary at the Valorem blog. 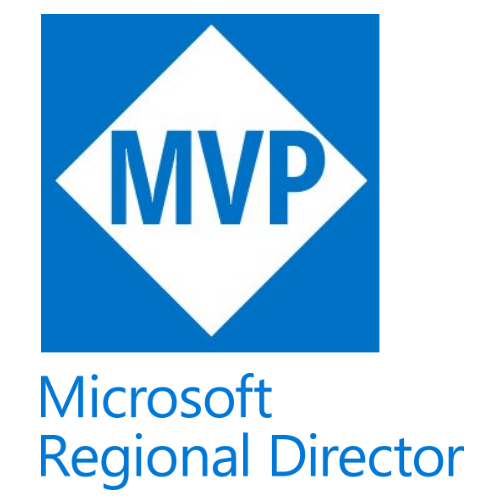 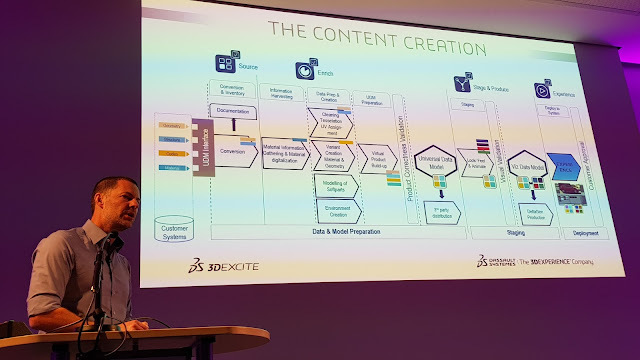 The content for my talk can be found here. AWE was kicked off with a keynote by Ori Inbar who was sporting a jacket with illuminated AWE letters. Definitely a fun way to start a conference! 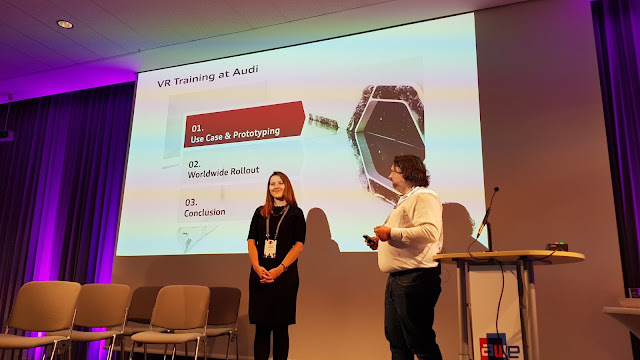 All sessions were recorded and will be posted on the AWE YouTube channel. 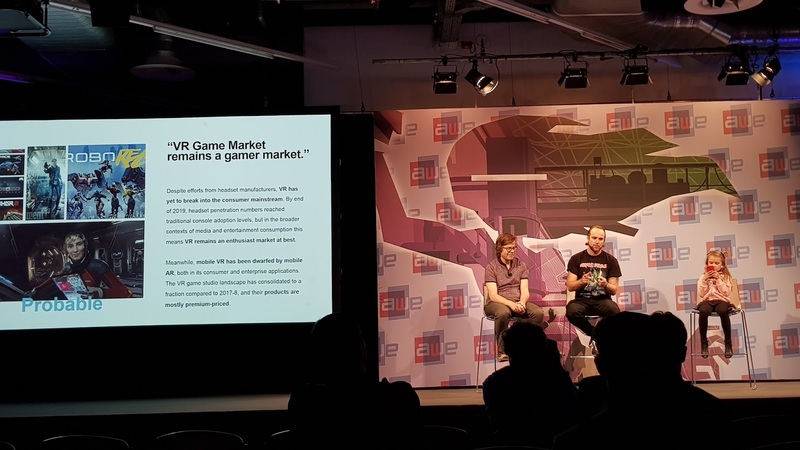 A couple of gold and silver AWE sponsors were also invited on stage in a "press conference" session to announce their new products. 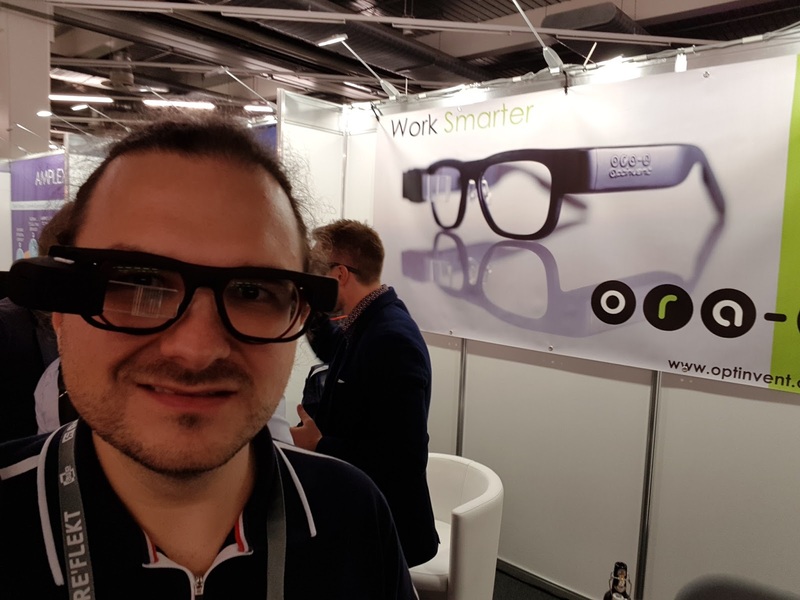 Emteq’s unique OCOsense™ smartglasses contain many tiny sensors in and around the glasses frame and use AI/Machine Learning to read and interpret the wearer’s facial movements and expressions, without cameras, wires or restrictive headgear. OCOsense™ will be available in 2018 and will combine both real-time facial expression tracking with a cloud-based analytics engine, facilitating emotional response analysis for scientific and market research. 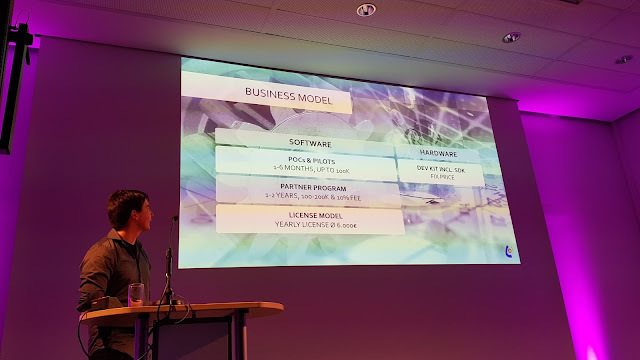 After the keynotes and press conference the different tracks started. 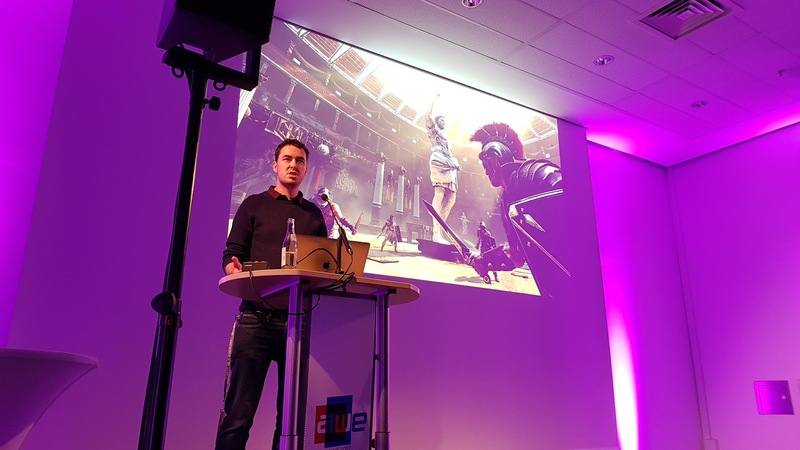 Ed from Scape kicked off the Creators/Developers track talking about their city-scale location tech he and his team are developing in London. 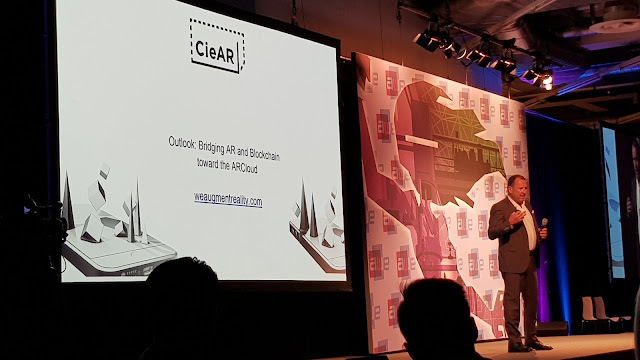 He didn't share a lot details as they are in semi-stealth mode but what the topic reminded me of the ARCloud and how important large scale location AR is. 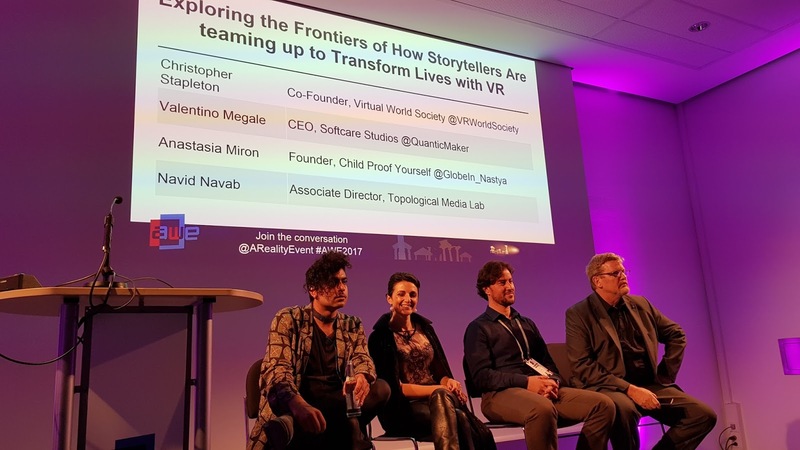 Shortly after Ed it was my take on Massive Mixed Reality. 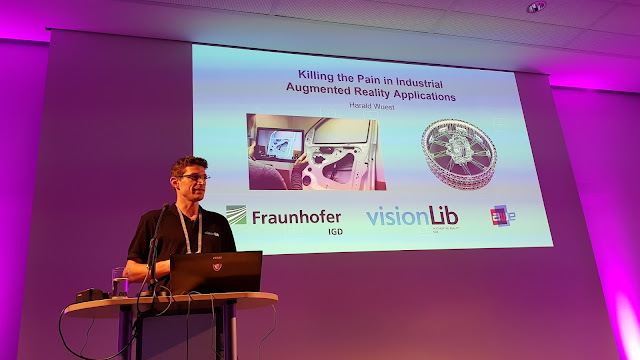 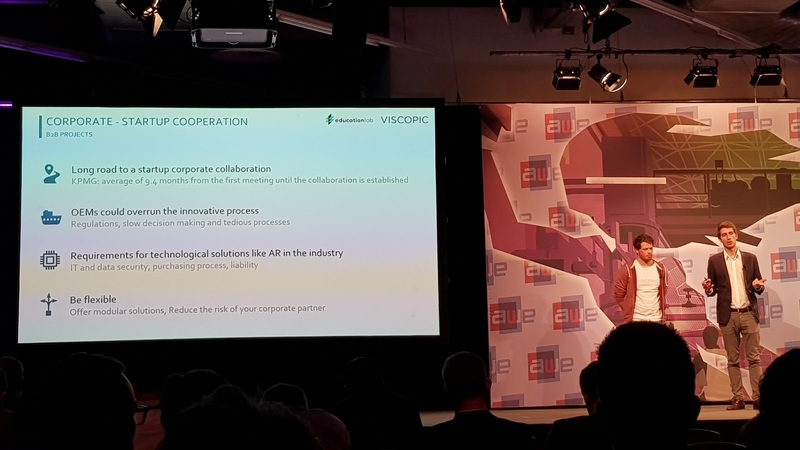 Harald Wuest from VisionLib (a spin-off from Fraunhofer IGD) talked about their CAD-model based tracking which is similar to Vuforia's Model Targets. Kudos to Harald for squeezing in a live demo in this very short presentation time. 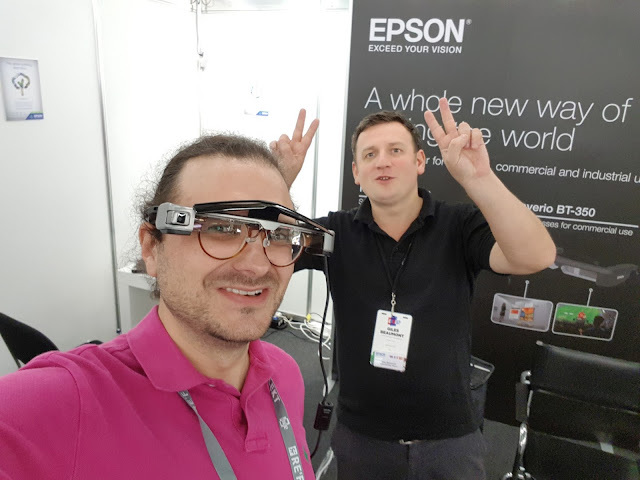 I was also able to try it out myself at VisionLib's booth and was impressed with the quality and how well it worked even with varying light conditions. 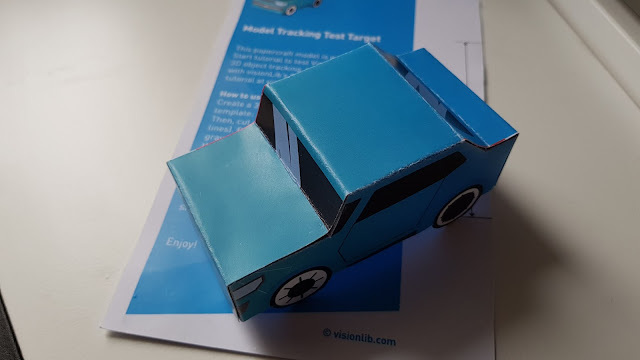 At the booth I also got a test target paper model which I folded already and I'm eager to run some tests with their HoloLens API. 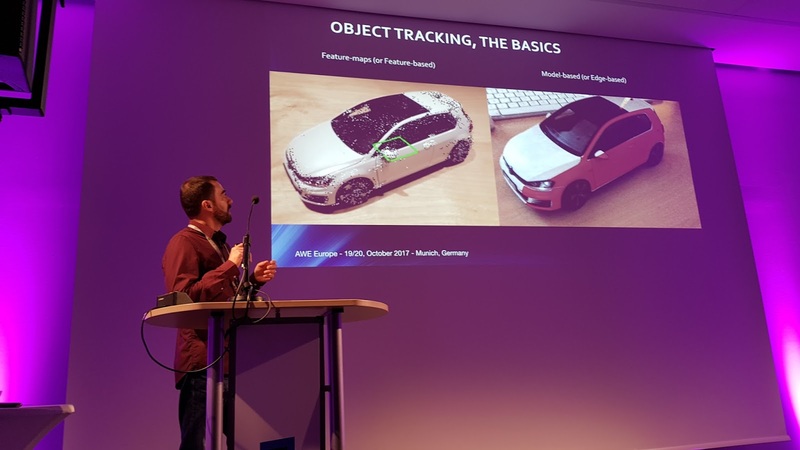 Allessandro Terenzi from AR-media presented a great overview about the history of AR tracking starting with markers and the current state of the art object tracking with feature-maps and model-based approaches. 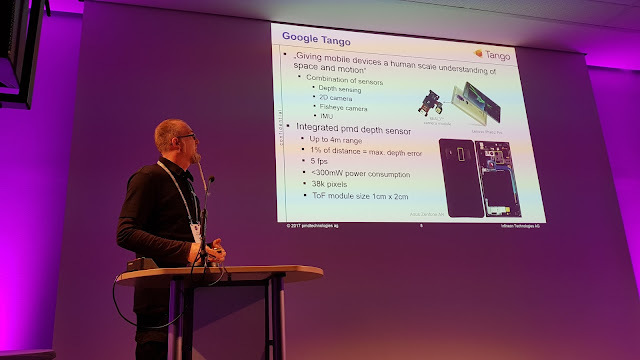 pmd talked about their Time of Flight depth sensor which is being used in the Meta 2, some Google Tango and other devices. 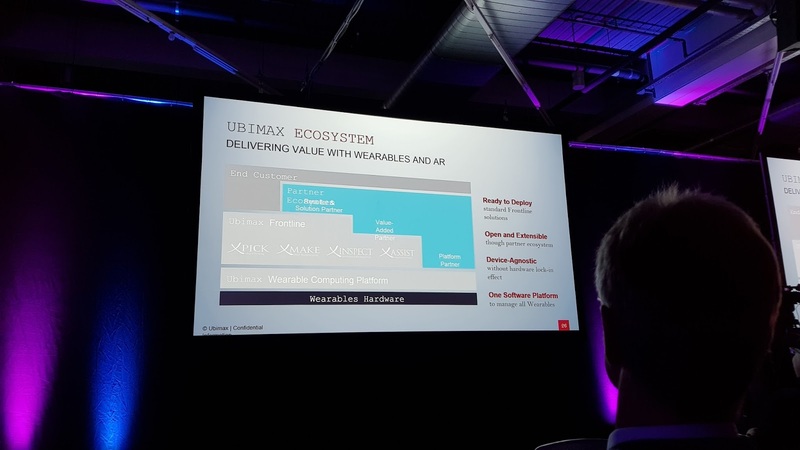 It can also be acquired as a standalone sensor. The ambient-light invariance was really impressive allowing the sensor to work outdoors as well. 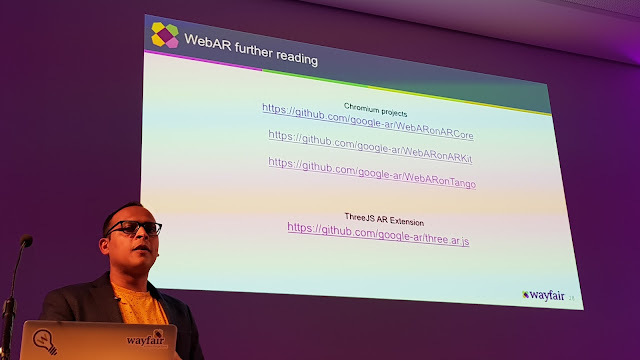 A gentleman from Wayfair was talking about their approach to bring AR to retail with WebAR leveraging experimental Chromium releases at the moment. 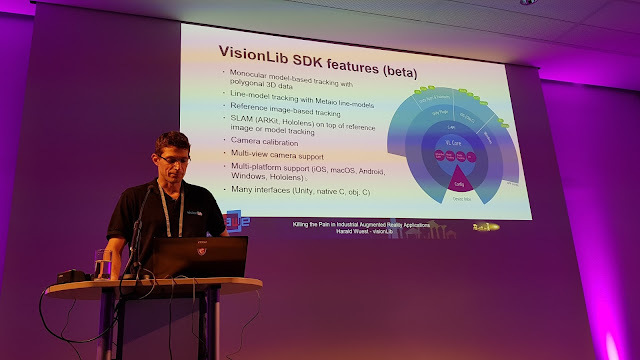 One of my favorite talks was given by Khaled Sarayeddine from optinvent. He broke down the optics used for different, state of the art AR see-through devices. 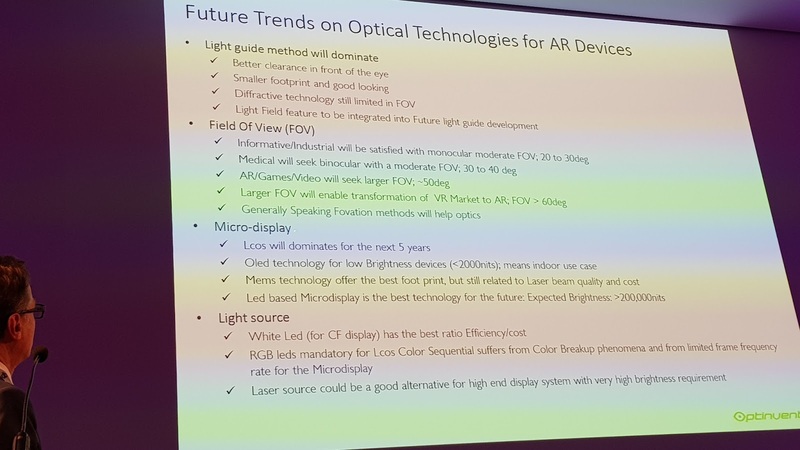 I have never heard such a comprehensive overview of AR see-through tech in such a detailed way. 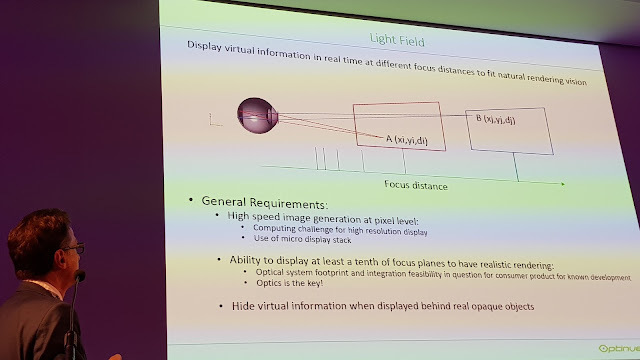 Khaled Sarayeddine is one of the few internationally-recognized optics experts and overall a very nice guy. 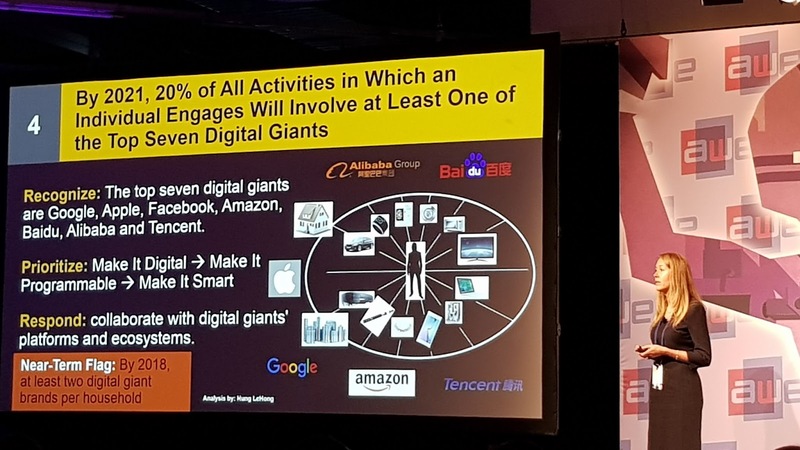 I was able to catch up with him after his talk and he shared more interesting industry insights. 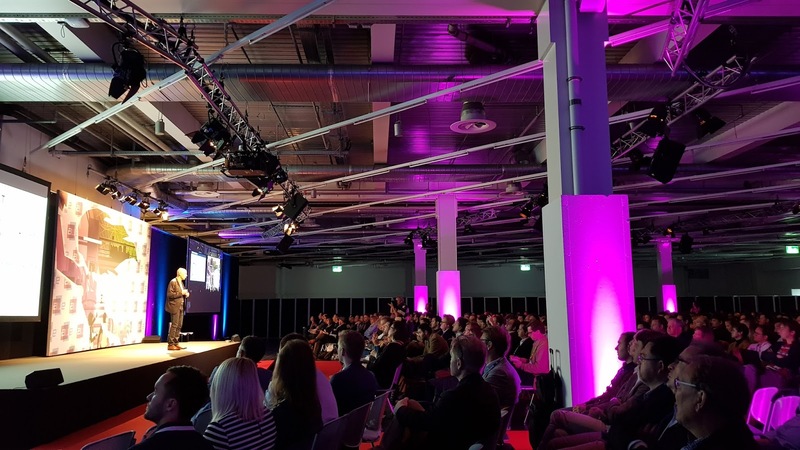 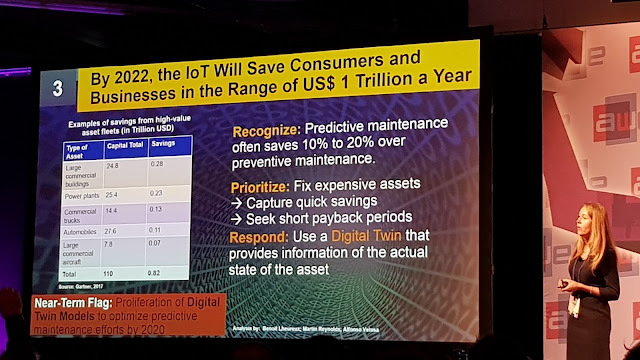 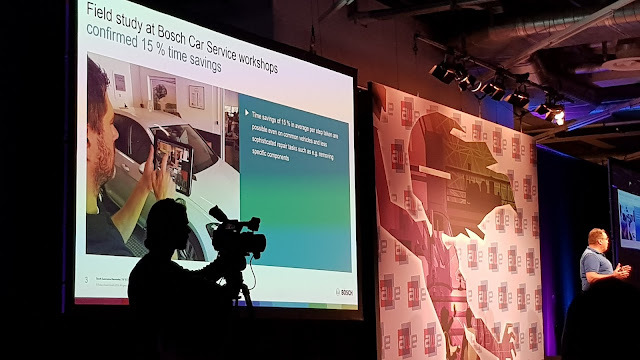 AWE Europe was held in Munich in southern Germany which is the home to lots of (automotive) industry, so there were also informative sessions covering Digital Transformation of the industry and how it relates to AR/VR. Adam Somlai-Fischer from prezi showed a preview of their upcoming, exciting AR features. 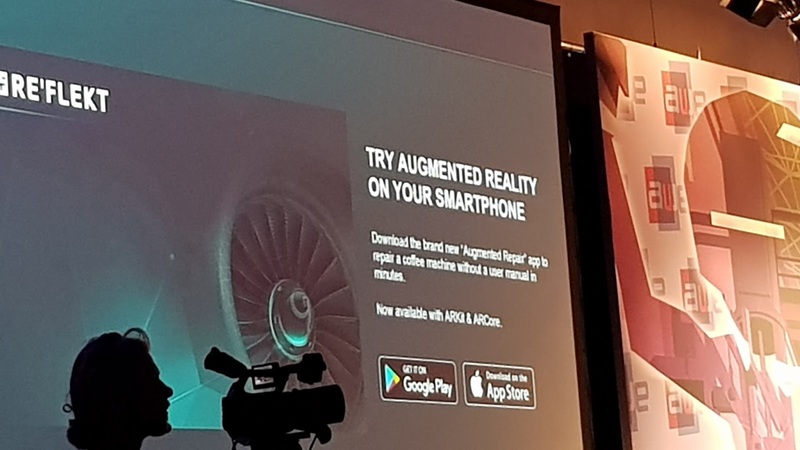 Pretty cool feature and maybe we will be giving presentations in the future via AR. 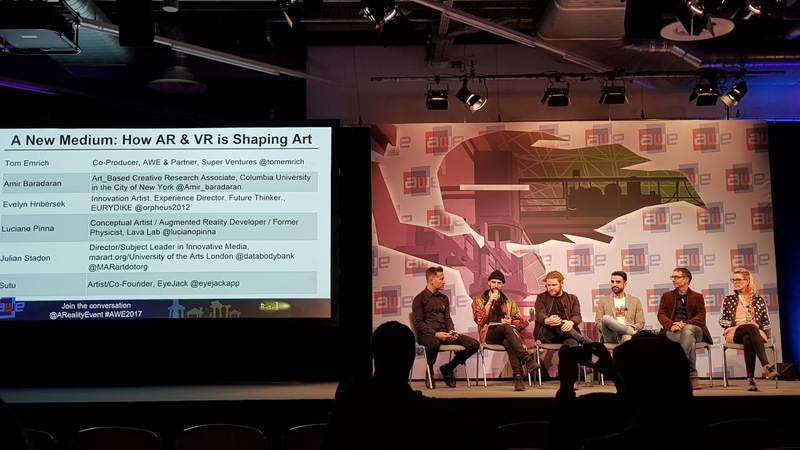 I also attended a few interesting panels covering the VR game market, the art of storytelling and how VR/AR is being used as a new medium by artists. 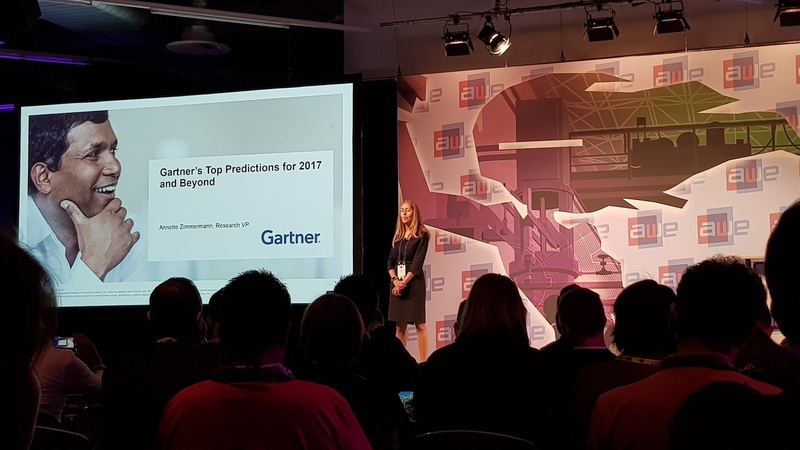 Gartner presented their Top 5 Predictions about Digital Transformation which were insightful as usual. Gartner is estimating by 2020 more than 100 million consumers will shop in AR and that mobile AR (which I call Classic AR) will be dominant at least till the end of 2018. 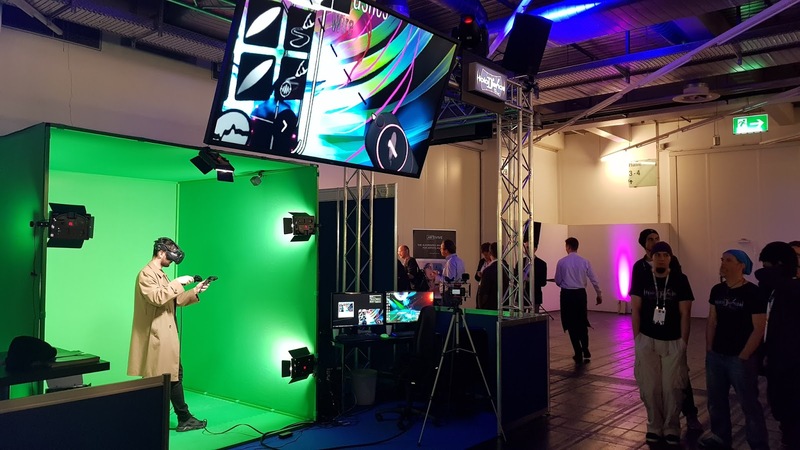 The exhibition area at AWE was packed with lots of interesting booths. 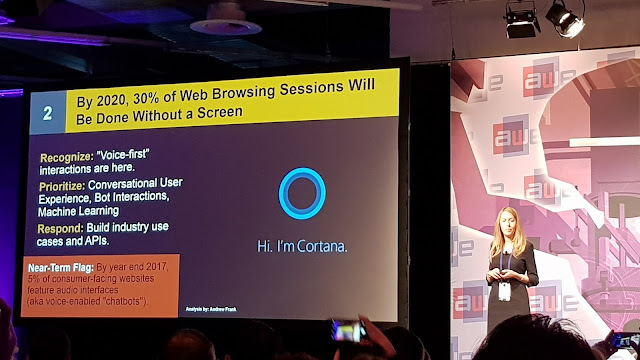 In fact they had so much amazing tech the 2 days were not even enough to explore everything. 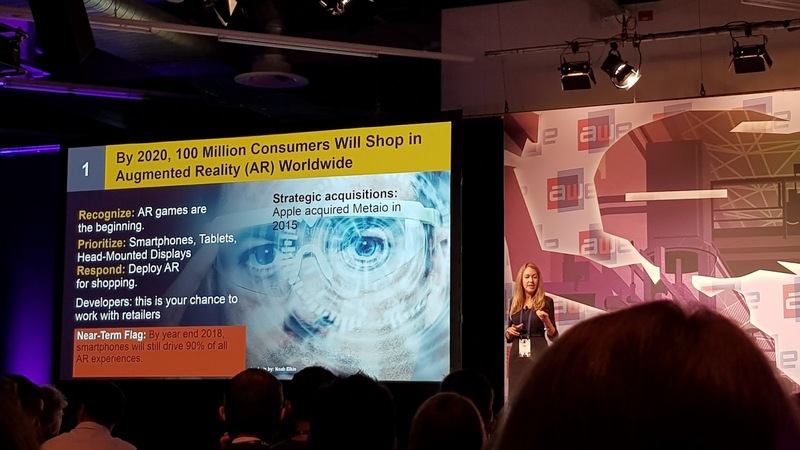 Classic AR will drive the mass adoption for a while but there's little doubt that HMDs are the real Future AR. I was able to try a few new smart glasses which are available on the market. 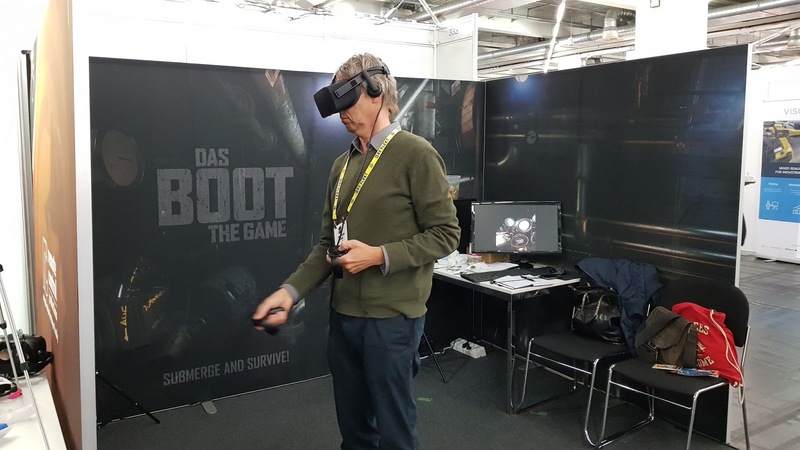 Disclaimer: This post is no review and just a subjective write-down of my experience. Keep in mind, every device is on the market for a reason and fulfilling a certain demand. 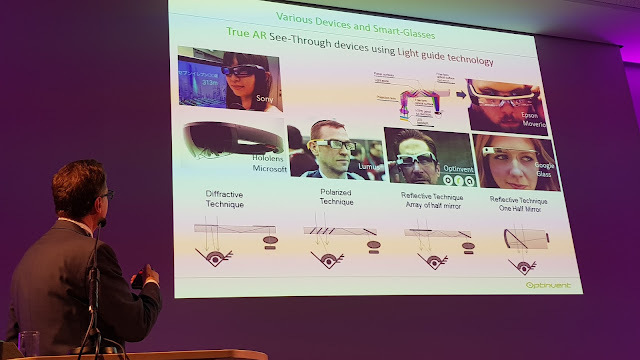 These devices show a screen in front of one or both eyes but don't track the environment, so the overlays are non-spatially integrated. The form factor is very lightweight. 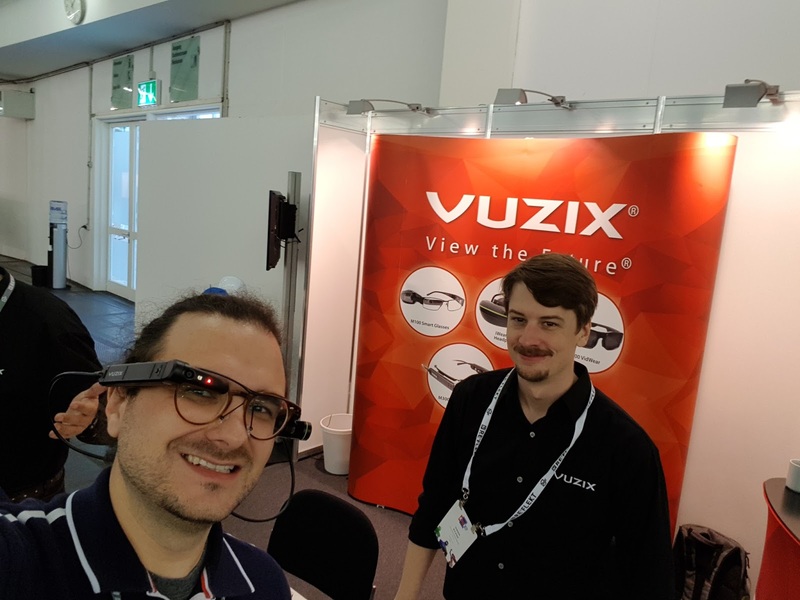 Some of those devices use different light guide optics (Optinvent, Epson, Google Glass) or just a simple, small display like the Vuzix which is on the other hand highly modular and configurable. The prototype from Fraunhofer FEP in Dresden is using beam splitting similar to the Meta 2 display tech. 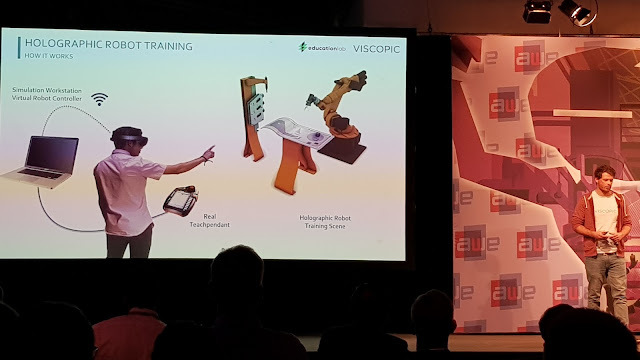 The Fraunhofer prototype is super low-power and the screens act as a camera at the same time performing eye tracking, so I was able to scroll the UI with my eye movement. 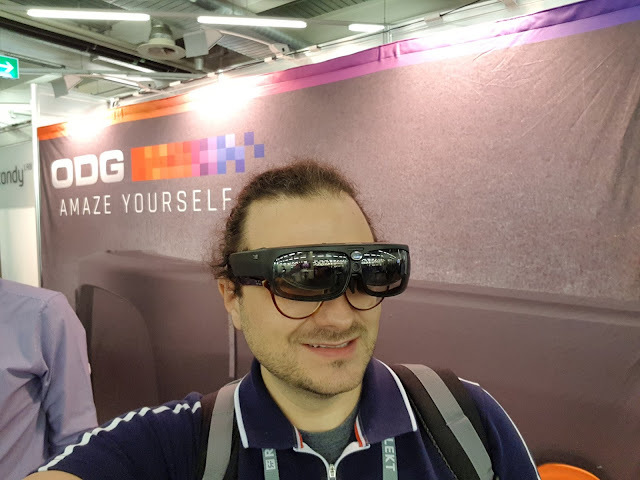 The ODG R-9 provides a wide field of view and the new DAQRI Smart Glasses also had a decent FoV. 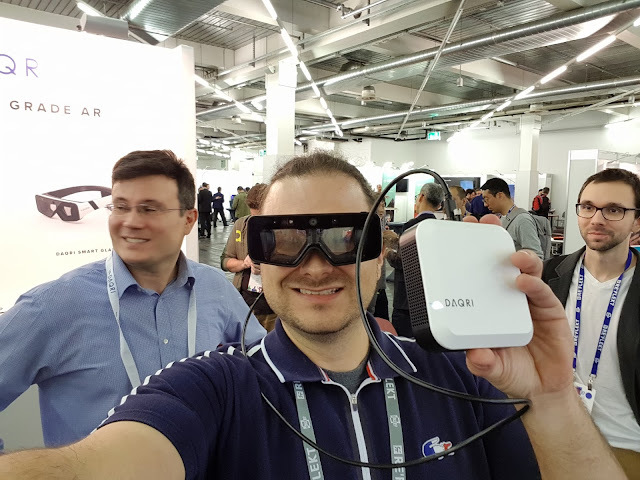 The DAQRI Smart Glasses use a nice form factor running the computing unit in an external box that can be clipped to the belt. The rendering quality was great with the DAQRI as well. 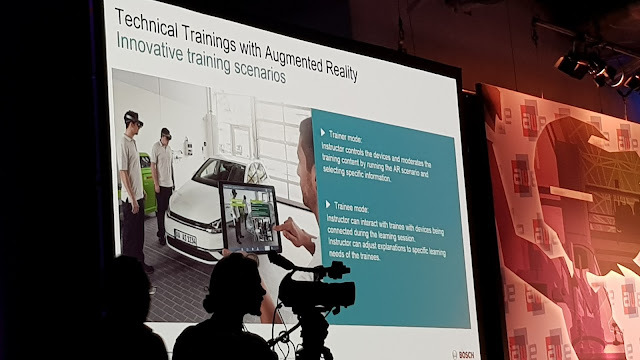 Both device's inside-out tracking capabilities still lack quite behind the HoloLens which is no surprise considering the HoloLens has a dedicated HPU and went through intense calibration. More impressions from AWE and some interesting things I spotted like a few very immersive VR games and prototype shoes to walk in VR. The artist Sutu performing live painting with the HTC Vive and TiltBrush. 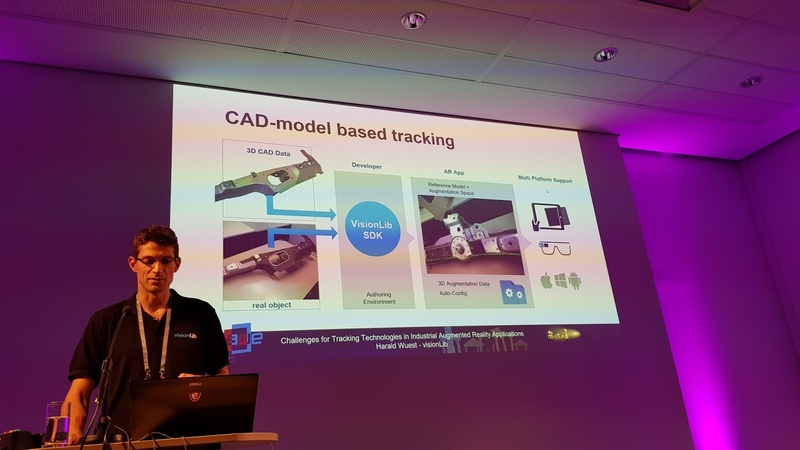 A full-blown VR welding simulator using AprilTags to track real welding equipment. 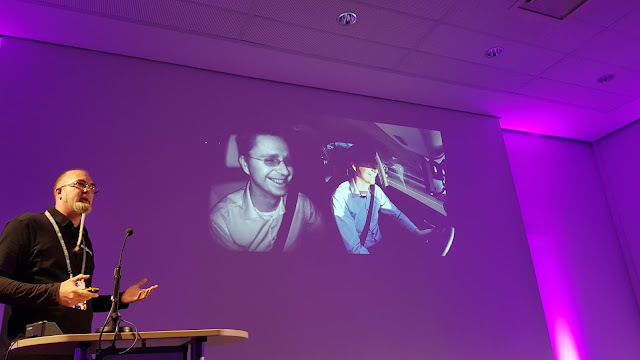 The helmet has a light array and 2 cameras outside and a screen inside showing the Augmented Virtuality experience. 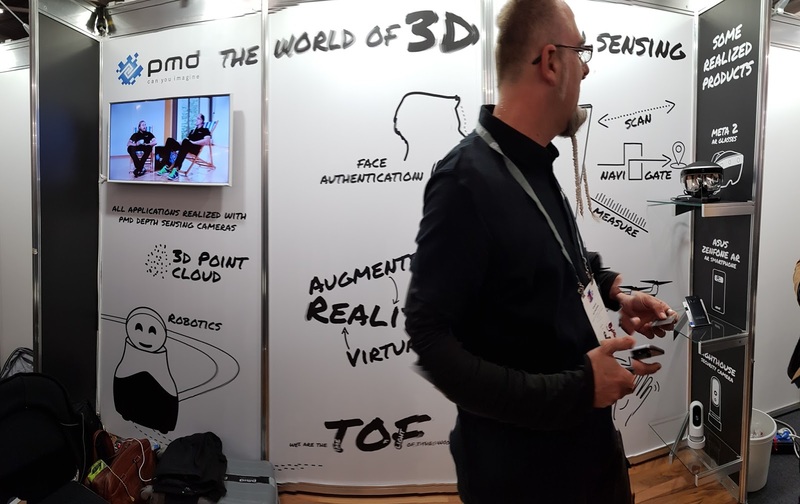 The metallic material simulation and the real hardware integration was very impressive. 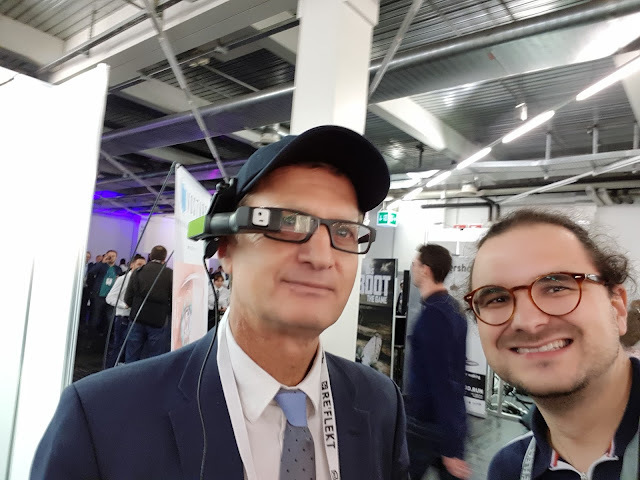 The German startup Holo-Light showed a prototype of a pen they are developing called Holo-Stylus which is supposed to provide 3D pen input. The device leverages optical infrared tracking using an IR camera bar mounted on top of the HoloLens. 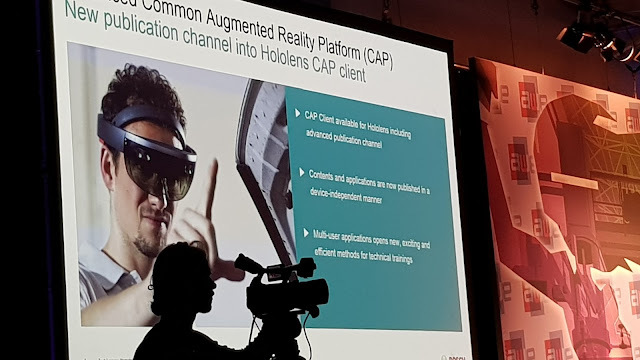 The prototype was using Wi-Fi to connect with the HoloLens but the final product is supposed to work via Bluetooth. It's an interesting concept and I'm curious to try it out once it's more mature and works flawlessly. 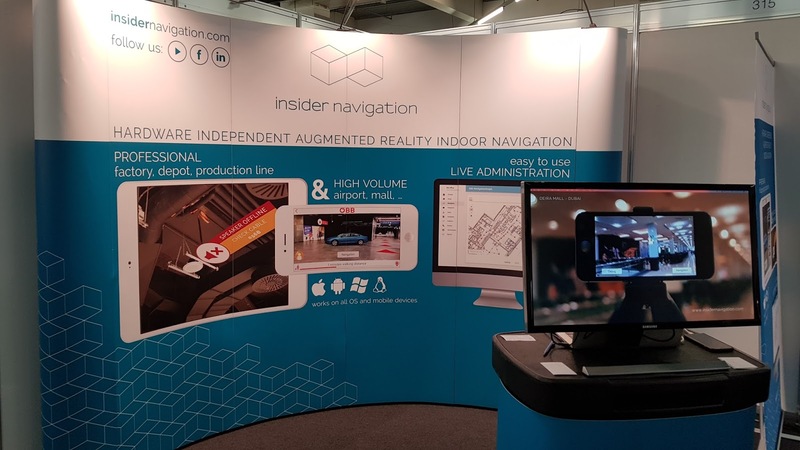 InsiderNavigation showcased their software solution for indoor navigation using SLAM-based point cloud mapping and AR overlays. Last but not least I was pleasantly surprised that Vuforia showcased our very own Tire Explorer HoloLens app at their booth as an example for Model Targets.